^ Electronic Frontier Foundation Mission Statement. [December 24, 2009]. ^ WIPO Electronic Frontier Foundation. [March 6, 2009]. （原始内容存档于2000年8月23日）. ^ Participants. Global Network Initiative. [2010-01-22]. ^ Barlow, John. 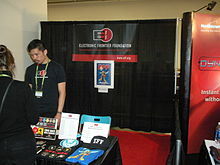 A Not Terribly Brief History of the Electronic Frontier Foundation. [Jan 12, 2010]. ^ Formation documents and mission statement for the EFF. EFF.org. Electronic Frontier Foundation. [March 6, 2009]. ^ McCullagh, Declan. EFF reaches out to D.C. with new office. CNET News.com. 2006-04-27 [March 6, 2009]. ^ EFF Cooperative Computing Awards. [December 24, 2009]. ^ Bishop, Katina. EFF Gives $50,000 to Finder of Largest Known Prime Number. EFF.com. 2000-04-06 [December 24, 2009]. ^ Knoll, Landon. Record 12-Million-Digit Prime Number Nets $100,000 Prize. EFF.com. 2000-04-06 [December 24, 2009]. ^ 13.0 13.1 Secure Messaging Scorecard. EFF. [21 April 2017]. ^ EFF: Internet Pioneer Gives Over $1.2 Million to EFF to Defend Online Freedom. [March 6, 2009]. （原始内容存档于2004年3月1日）. ^ Electronic Frontier Foundation. Charity Navigator（英语：Charity Navigator）. [March 6, 2009]. Godwin, Mike. Cyber Rights: Defending Free Speech in the Digital Age（英语：Cyber Rights: Defending Free Speech in the Digital Age）. Cambridge: MIT Press. 2003. ISBN 0262571684. Goldsmith, Jack. Who Controls the Internet?（英语：Who Controls the Internet?）. Oxford Oxfordshire: Oxford University Press. 2006. ISBN 0195152662. Jones, Steve. Encyclopedia of New Media. Thousand Oaks: Sage Publications. 2003. ISBN 0761923829.